The AU Water Resources Center has worked on a multidisciplinary, collaborative project with other researchers and the Alabama Cooperative Extension System to advance animal waste management on farms throughout the southeastern US. The Web-based Poultry Litter Decision Support System is designed to assist Animal Feeding Operations (AFOs) and potentially Confined Animal Feeding Operations (CAFOs) with Nutrient Management Plans, Record Keeping of Nutrient Application Activities, and Transport of Excess Litter. In addition, this DSS provides a platform for Communicating Litter Availability and Needs to other users of this system. This paper presents a methodology to optimize poultry litter application and transportation through efficient nutrient management planning and transportation network analysis. 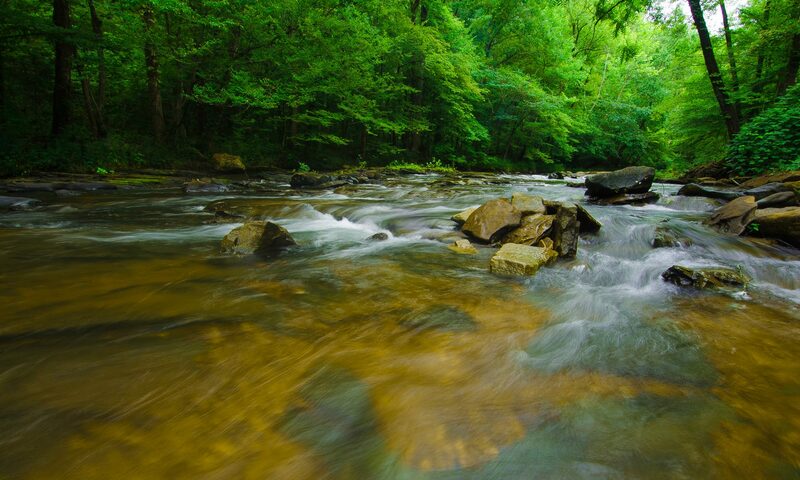 Once fully developed and implemented, a system utilizing this methodology will help alleviate water quality problems in the Appalachian Plateau region and poor soil fertility problems in the Black Belt region by optimizing land application and transportation. Kang, M.S., P. Srivastava, J. Fulton, T. Tyson, F. Owsley, and K.H. Yoo. 2006. Optimal Poultry Litter Management through GIS-based Transportation Analysis System. Journal of the Korean Society of Agricultural Engineers (JKSAE) 48(7): 73-86. Subsurface band application of poultry litter is effective in reducing nutrients in runoff and leachate relative to surface broadcast application of litter. Some field plot arrangements, such as plots having adjacent pits in the soil, prevent the use of conventional field equipment incapable of traversing the pits. A new method was developed to make trenches in the plots for the purpose of subsurface band application of poultry litter. Small trencher for making trenches in soil for subsurface band application of broiler litter: (a) right side view (dimensions are in mm) and (b) right side view when the trencher was raised up out of the soil. Vertical pin shown in the upper right in “b” allowed trencher to pivot about that vertical axis. Upper square steel tube in the upper right in “b” is the cantilever beam from the forklift. Longitudinal distance from the center of the left front wheel to the center of the right rear wheel is 15 cm. Inner surface of each wheel is 10 cm laterally outboard of trencher wall. Lamba, J., T.R. Way, P. Srivastava, and D.B. Watts. 2015. A Method for SubsurfaceBanding Poultry Litter in Plots Not Accessible with Conventional Field Equipment. Applied Engineering in Agriculture. 31(4): 555-558. A field experiment was conducted to determine the effects of subsurface band application and surface broadcast application of poultry litter on nutrient losses in leachate. Results of the rainfall simulations showed that the concentrations of PO4 –P and total phosphorus (TP) in leachate were reduced by 96 and 37%, respectively, in subsurface-banded litter treatment compared with the surface-applied litter treatment. There was no significant difference in PO4 –P concentration between control and subsurfacebanded litter treatment in leachate. Mean (n = 3) ortho-P and total phosphorus loading in surface runoff and leachate from control, surface-applied, and subsurface-banded litter plots. Lamba, J., P. Srivastava, T. Way, S. Sen, C. W. Wood, and K. Yoo. 2013. Nutrient Loss in Leachate and Surface Runoff from Surface-Broadcast and Subsurface-Banded Broiler Litter. J. Environ. Qual. 42:1574-1582. The objective of this study was to evaluate differences in nutrient transport between subsurface-banded and surface-applied broiler litter in a tall fescue pasture. This study showed that subsurface banding of broiler litter can substantially reduce nutrient losses in surface runoff. However, since less than 10% of the simulated rainfall contributed to surface runoff (more than 90% rainfall infiltrated), subsurface transport of nutrients from surface-applied and subsurface-banded litter needs to be studied in field research. Flow-weighted concentrations of selected constituents in surface runoff from control, surface-applied, and subsurface-banded litter plots. Lamba, J., T. Way, P. Srivastava, S. Sen*, C.W. Wood, and K. Yoo. 2012. Surface Transport of Nutrients from Surface-Broadcast and Subsurface-Banded Broiler Litter. Transactions of the ASABE 55(3): 995-1002. The specific objective of this study was to identify surface runoff generation mechanisms (infiltration excess versus saturation excess) using distributed surface and subsurface sensors and rain gauge. The results indicate that perhaps subsurface flows and transport of P in subsurface flows need to be quantified to reduce P contamination of surface water bodies in this region. Sen, S., P. Srivastava, K. Yoo, J. Dane, J. Shaw, and M.S. Kang. 2008. Runoff Generation Mechanisms in Pastures of the Appalachian Plateau Region of Alabama – A Field Investigation. Hydrological Processes 22(21):4222-4232. Currently, limited research on the fate of antimicrobials in the environment exists, once they are discharged in human and animal wastes. Sorption of two antimicrobials, sulfadimethoxine (SDM) and ormetoprim (OMP), was investigated in two soils and sand using a series of batch experiments. Overall, sorption of both antimicrobials increased in the selected soils and sand as the organic matter, clay content, and cation exchange capacity increased. These experiments indicate relatively low sorption of SDM and OMP in natural soils, making them a potential threat to surface and ground water. Single solute versus co-solute sorption for (a) Soil 1 with ormetoprim (OMP), (b) Soil 2 with OMP, (c) Soil 1 with sulfadimethoxine (SDM), and (d) Soil 2 with SDM. Sanders, S., P. Srivastava, Y. Feng, J.H. Dane, J. Basile, and M.O. Barnett. 2008. Sorption of veterinary antimirobials sulfadimethoxine and ormetoprim in soil. Journal of Environmental Quality, 37(4): 1510-1518. The main focus of this study is to develop a poultry litter decision support system (PLDSS) integrated in a geographical information system (GIS) for land application and off-farm usage of poultry litter in the Appalachian Plateau and Black Belt regions of Alabama. Overall, the PLDSS will help provide an optimal, state-wide management of poultry litter, which is crucial for sustaining the poultry industry in Alabama. It will also help row crop agriculture and beef cattle industry to grow in the Black Belt region. This experiment assessed the impact of vegetative filter strips on concentrations and mass losses of Cu, Fe, K, Na, Ni, and Zn in runoff from fescuegrass plots treated with poultry litter. Runoff Ni concentrations were below detection levels in all cases. Concentrations of Cu, Fe, K, Na, and Zn did not differ between litter-treated plot lengths but were significantly affected by VFS length. Results indicated that concentrations of Cu, Fe, K, and Zn did not significantly decrease after a VFS length of 3 m, while Na concentrations decreased up to a VFS length of 6 m.
Edwards, D.R., P.A. Moore, Jr., T.C. Daniel, P. Srivastava, and D.J. Nichols. 1997. Vegetative filter strip removal of metals in runoff from poultry litter-amended fescue grass plots. Transactions of the ASAE. 40(1): 121-127. The objectives of this study were to assess the effect of length of manure treatment on runoff concentrations of poultry litter constituents and to define the modes of transport (particulate versus soluble) for nitrogen (N), phosphorus (P), carbon (C), and solids. Manure-treated length had no effect on runoff concentration of any parameter, indicating that a manuretreated length of only 3.0 m would have been sufficient to simulate runoff quality associated with longer manure length treatments. These results indicate that for conditions similar to those of this study, extrapolation with respect to runoff concentrations might be possible with little adaptation of the data and might simplify the design of management practices that key on edge-of-field runoff concentrations. Edwards D.R., P.A. Moore, Jr., T.C. Daniel, and P. Srivastava. 1996. Poultry litter treated effects on quality of runoff from fescue plots. Transactions of the ASAE. 39(1): 105-110. The State of Alabama recently adopted an animal waste disposal regulation that requires farmers to adapt a waste management practice considering rate of application and watershed and land use characteristics. The objective of this study was to develop an animal waste pollution potential index (AWPPI) that can be used by farmers and regulators to rank areas based on susceptibility to nonpoint source (NPS) pollution from land application of poultry litter. The AWPPI was found to be significantlycorrelated to poultry house density in a watershed and ratio of litter application area to watershed area. This method presents a simple approach to identify areas having higher susceptibility to NPS pollution and where best management practices may need to be implemented to reduce NPS pollution from animal waste application. Chaubey, I., P. Srivastava, L. Han, S.N. Addy and X. Yin. 2000. Using GIS, remote sensing and water quality modeling to estimate animal waste pollution potential. P.K. Bollich (ed.). In Proc. Agricultural Water Quality and Quantity: Issues for the 21st Century 136-143.